I can't tell if this is your prettiest design yet, or if I just think that every time. It really is beautiful. 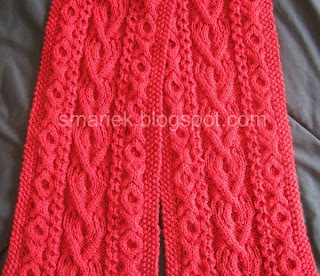 Very pretty scarf. I'm sure many will appreciate row by row instructions. This is so lovely. An interesting pattern and a lovely color. Thanks for the pattern. I'm going to need some time to look through all of your patterns. This is absolutely one of the most gorgeous scarf patterns I've seen! Thank you so much for sharing it with us. I am exited to check out your other designs as well.